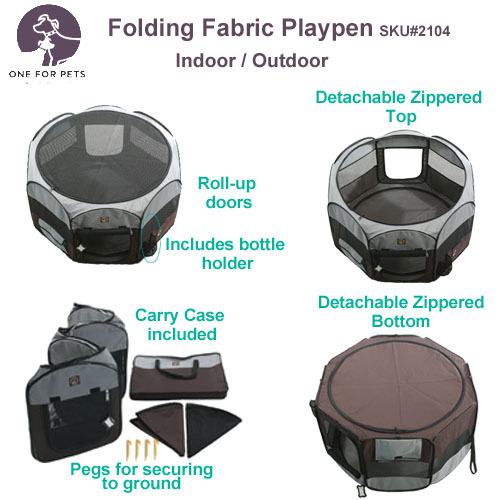 With this versatile, portable, eight-panel Folding Fabric Playpen, it’s a breeze to take your pet with you when you go to work, visit friends or relatives, or enjoy fun outdoor activities. 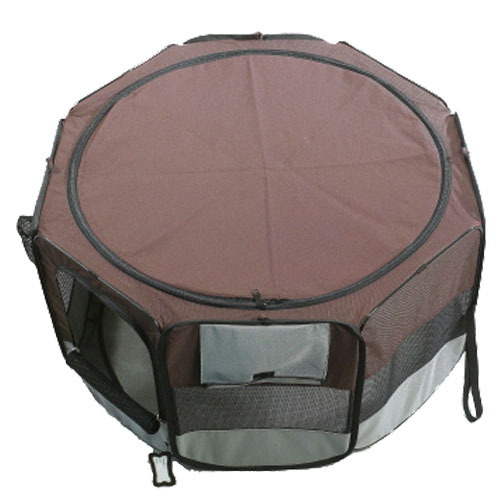 Just set up your pet’s very own private, personal home-away-from-home anywhere convenient – indoors or outdoors – in just a few seconds, and he/she will feel safe, comfortable, and ready to play or sleep. Measurements: 36″ x 36″ x 19.5″ tall. 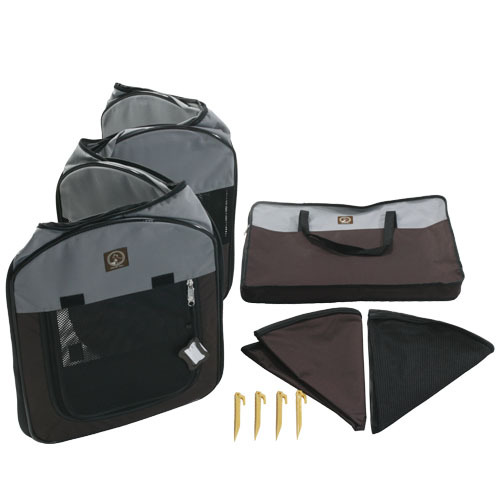 Ideal for: a new puppy/kitten that needs to stay close to you for some extra love, care and attention; a dog competing in a show – it will calm down as you prepare it in this safe, private, familiar environment; training centers and dog hotels where dogs need their own quiet,undisturbed space. 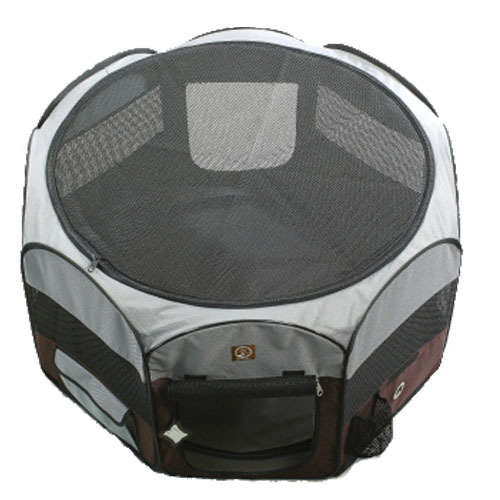 The playpen: Is simple to set up, and folds flat in seconds; Has a detachable top mesh and bottom panel for maximum flexibility; Has stake straps that secure it to the ground when you set it up outdoors; Has a removable, washable, and replaceable bottom panel; Comes with convenient side pockets for extra storage, plus a strap so you can attach a water bottle; Is light-weight, so it’s easy to fold up and store away in its carry-bag(included in the price) when not in use – perfect if you don’t have lots of space in your home. 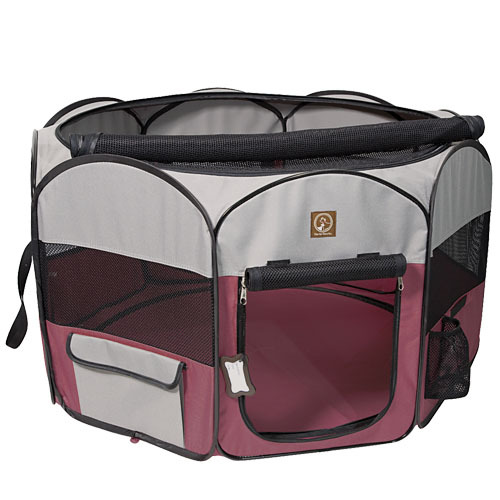 Just a word of advice: Please don’t leave your pet (especially a puppy or a kitten) unattended inside the Folding Fabric Playpen with the zippers closed. 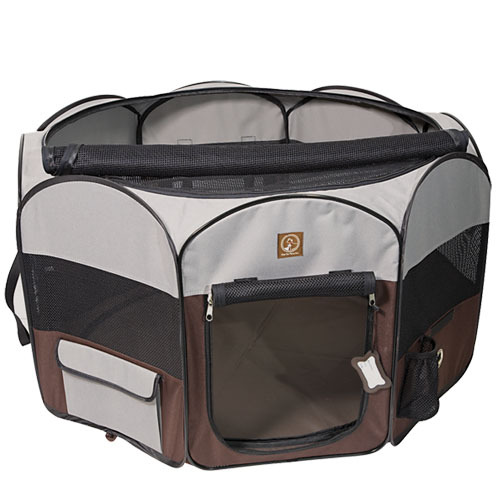 If you do, he/she could become anxious and chew or pull on the zippers – that’s not good for your pet, OR the Folding Fabric Playpen.